If you're considering the purchase of an inground fiberglass pool and have done any research on the web, you've probably encountered some discussion of the problems associated with fiberglass pools. The purpose of this article is to address, with full disclosure, five of the most common pool problems associated with fiberglass pools...but we won't leave you there. We'll also discuss the causes of these problems and how you, the consumer, can avoid them. But in the spirit of full disclosure, we have to point out that these "problems" are both very rare and often completely avoidable. No, every job did not go perfectly. But because of the sheer volume of pools we’ve installed and the scores of conversations with fiberglass pool manufacturers and installers from all around the world, we have an intimate knowledge of the good, the bad, and the ugly of inground fiberglass pools. Now we can share this information with you in the hopes that you'll never end up on one of those online swimming pool forums pleading for help. Learn how we make your fiberglass pool and how our methods revolutionized the industry. Colored fiberglass pools have become the norm. 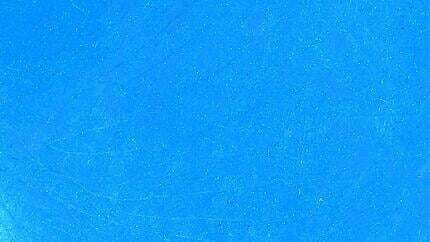 Virtually all manufacturers now offer a variety of colors beyond the standard white and baby blue marine gelcoat. The problem simply stated is this: if you need to repair a pool, it can be difficult to match some colored finishes with the factory finish. The reality is that the vast majority of fiberglass pools do not need repairs within the first 20 to 40 years. However, sometimes issues arise that merit repair work. It could be something small, like a rock flying up and hitting the pool during shipping, or a structural crack. Granted, these instances are very, very rare, but they do happen. Well, we can't change the fact that some fiberglass pools are going to need repairs for one reason or another. But to lower the risk of having a sub-standard repair, you should look for two things: a solid surface finish and a well-trained repair technician. Some colored finishes are applied in multiple layers (solid color, metallic flake, and clear coat, for example). These layers overlap each other to achieve the desired look. However, when someone attempts a field repair with these multi-layered finishes, matching the factory look is difficult, because it’s impossible to duplicate the manufacturing process. In contrast, a solid surface finish is applied only once, which makes field repairs to fiberglass pool gelcoat a lot less daunting. Typically, these repairs are a closer match to the factory finish. If this is an important issue to you, research the various fiberglass pool manufacturers to determine if their colored finish is a solid surface or multi-layered finish. At River Pools, we only use solid surface gelcoat finishes, in a single application. There's no guarantee that any repair will be seamless. In fact, the truth is that it will likely be noticeable if you're looking for it. However, a properly trained and attentive technician can make the difference between a repair that looks like a patch on a pair of jeans and a barely noticeable cosmetic detail. The best policy is to try to prevent any field repairs altogether by producing high-quality pools and putting them through a rigorous inspection program like we do here at River Pools. We have almost no employee turnover, and our technicians take tremendous pride in their work and are fully trained. We have some good and bad news about gelcoat spider cracks. The bad news: it's hard to see them in the image because even in an empty pool they don't show very well. The good news: it's hard to see them, so in the unlikely event that they develop in your pool, you likely won't care. Spider cracks have always been accepted as a reality of all types of fiberglass products. But what exactly is a spider crack? Spider cracks are hairline cracks that occur in the surface layer, or gelcoat, of a fiberglass product. They are not structural in nature—the crack is normally only through the thin layer of gelcoat and does not typically extend into the structural laminate layers of the pool. They are typically isolated to one small area of the pool and not a phenomenon that affects large areas. Gelcoat spider cracks in fiberglass pools are a result of pressure on a given point of the pool shell that exceeds the gelcoat's ability to flex. This pressure could be a result of improper shipping, improper manufacturing, or improper installation. Before we began manufacturing at River Pools, we sometimes had pools by other manufacturers that were simply built too thin and couldn't withstand the pressures of lifting and shipping. They arrived on the job site with gelcoat cracks, and unfortunately, we had to send them back. We've received pools that were built correctly but not stabilized properly during shipping with the same result. But installation is when the most common human error leads to gelcoat cracks. Sometimes a protrusion on the pool floor like a tree root or clump of dirt (neither should be there) exerts enough pressure to cause a spider crack in the gelcoat. 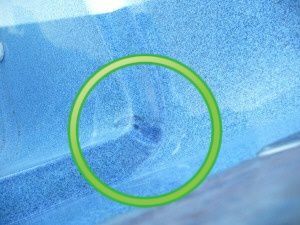 This occurs occasionally, but the most common cause of pressure on the floor of a fiberglass pool comes from the installer's attempts to level the pool shell. Many times, fiberglass pool installers are forced to attempt to level a pool shell that is 2–3" out of level despite their best efforts to modify the base that the pool rests on. They lift and tweak the pool shell until they get it within a tolerable range. This exerts a tremendous amount of pressure on the pool that sometimes results in gelcoat cracks that can happen immediately or eventually develop over time. It's also true that some manufacturers simply don't build level pool shells. This leads to these extreme efforts by the installer to make an unlevel pool level. Another cause of gelcoat spider cracks can stem from the manufacturing process. The ideal is 25 to 30 mils. If gel coat is applied too thick, it becomes less pliable and more prone to cracking. Find a manufacturer that produces level pools and applies gel coat at the right thickness. You could also contact some existing customers of both the contractor and the pool manufacturer you’re considering. It’s a good idea to contact recent customers as well as those whose pools have been installed for more than five years. This will give you a good idea of how the pool will hold up over time. If you talk to enough people or scroll through enough online forums, you'll probably come across someone who has developed a bulge in the wall of their fiberglass pool. We encountered this problem years ago with several pools we installed from other manufacturers. This caused us to scrutinize our installation process and thoroughly inspect the pools where these problems occurred. What we found stood in stark contrast to the standard method of installing fiberglass pools across the country. The problem in our case stemmed from the backfill material that we used...namely sand. Tens of thousands of fiberglass pools have been installed with sand backfill without incident, and most of our sand backfilled pools were fine as well. But when the right (or wrong) circumstances align, fiberglass pool walls can bulge. Question: What happens to sand when it becomes saturated with water? It liquefies. That would be fine if the liquefied sand were resting against something other than fiberglass, which is renowned for its flexibility. Fiberglass pools are structurally engineered to remain full of water. The outward pressure from the water works in conjunction with the structure of the pool to stabilize the vessel. When sand liquefies, it is heavier than the water on the inside of the pool. If the wall is not strong enough to maintain its shape, a bulge develops. High water tables as well as soils that hold water both lead to situations where a significant amount of water surrounds the pool structure and saturates the backfill material. So does this mean that fiberglass pools are not suitable for installations with high water table or certain soils? Quite the contrary; I would submit that there is no better pool to have in such circumstances. That your pool is strong enough to prevent bulges. That you eliminate the sand backfill and use gravel. Is there a difference between the strength of fiberglass pools? Yes, but from the perspective of the consumer, it will be virtually impossible to rate the "bulge-ability" of the various pools on the market, because all manufacturers claim to be the strongest and most stable. 1. Using un-filled resin. Many fiberglass pool manufacturers add filler to their resin, which obviously weakens the strength of the pool. 2. Build a thick pool. The average thickness should be somewhere between 3/8" to 1/2" depending on the section of the pool. 3. A well-designed laminate schedule. The right amount of material arranged in the ideal order will produce a stronger and more rigid structure. 4. Using structural comb supports. These "ribs" support the side walls of the pool and increase resistance to bulges. Most manufacturers use them, but many space them too far apart. On the installation side, the one thing you CAN control is the backfill material, and based on our experience, using gravel backfill is the only insurance against wall bulges in any situation with any pool. We use clean crushed blue stone ¾" or smaller gravel in our installations because it has several distinct advantages over sand or even round pea gravel. First, with gravel or stone, its properties do not change when it becomes saturated with water, so it performs the same, wet or dry. This makes it ideal for any situation and especially in areas with a high water table or difficult soil conditions. 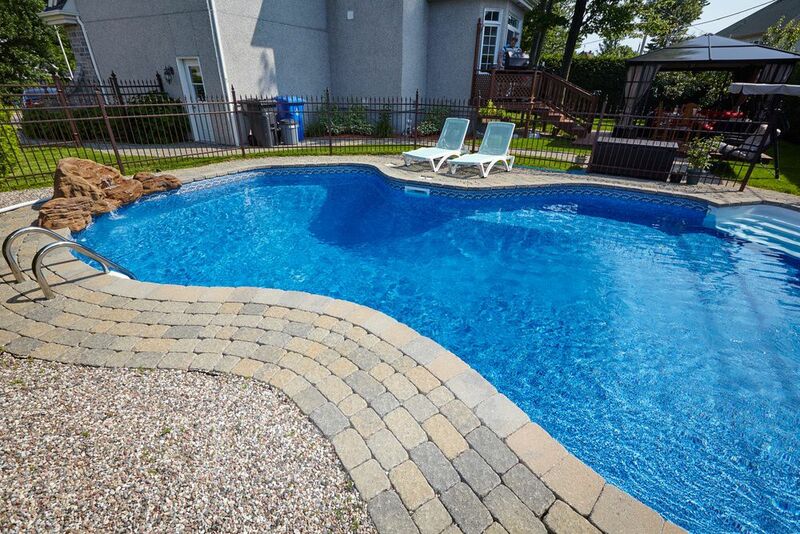 Second, the point-on-point friction that occurs between the pieces of gravel make it a very stable material on the sides of the pool—much better than saturated sand that liquefies or pea gravel that acts like little ball bearings. Third, the gravel compacts upon placement, unlike sand, which needs to be placed in lifts and compacted with water. We'll address this further in the discussion on plumbing problems below. You'll see that this is a major advantage as well. Opponents of gravel backfill say that it's a cheaper material and used in order to cut cost. In reality, it actually costs us significantly more to use gravel. We feel it is well worth the investment because you can't put a price tag on peace of mind. Yes, another gelcoat-related concern...are you seeing a trend? Before we jump into the topic of fading, why do you think 3 of the 5 most common problems with fiberglass pools are gelcoat issues? The answer: because we care deeply about the aesthetics of our pool. Well, if you're considering a fiberglass pool, I have some good news for you. Fading and discoloration will almost certainly not be a problem for you as long as the pool manufacturer does their part and follows manufacturing best-practices, and you do your part by properly maintaining your pool water chemistry. As a fiberglass pool manufacturer, we hold up our end of the bargain by using Cross-Lynx Composite Technology, our unique approach to fiberglass pool production. Fortunately, you are not necessarily condemned to a faded pool. Here’s what I suggest: call customers who’ve owned pools for five years or more, and ask them how their pool is holding up. This will weed out the bad ones and allow the cream to rise to the top. Why would the plumbing settle? Good question! The plumbing doesn't settle; the backfill material around the fiberglass pool settles and takes the plumbing with it. Yes, we're back to our sand vs. gravel discussion again. This is great because this is a topic that needs attention. The problem is that it's very difficult to fully compact sand around a fiberglass pool during installation. Many times, despite a fiberglass pool installer's best efforts to bring the sand up in 6"–12" lifts and fully saturate the sand with water, the sand still settles some over time. The plumbing is encased in this sand, and as the sand settles, it exerts downward pressure on the plumbing of the swimming pool. Many installers tie their plumbing up to help hold it in place, but that's still a lot of pressure. Settled plumbing manifests itself in one way...leaks. "Leak" is a dirty word! We want to avoid saying it, and we do so by using gravel backfill that just doesn't settle! If the backfill doesn't move, the plumbing doesn't move. It's not mere coincidence that we have legitimate solutions to the top 5 problems associated with fiberglass pools. At River Pools and Spas, we constantly scrutinize our products and processes to eliminate any potential problems and make life easier for everyone. You want to enjoy a problem-free pool for years to come, and it is our goal to make that a reality. For more information about inground pools and the different types, download our free ebook, "Comparing Fiberglass, Concrete, and Vinyl Liner Pools in the Modern Age." Editor's note: This blog article was updated on Janaury 7, 2019.